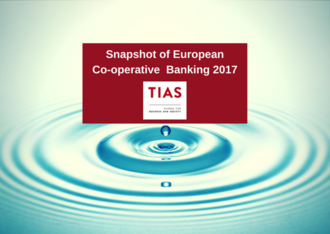 The EACB is pleased to announce the launch of a new publication entitled “Snapshot of European Co-operative Banking 2017” by Tias School for Business and Society at Tilburg University. The publication reviews developments in the overall performance of 18 co-operative banking groups in 13 European countries. The average performance is compared to that of the entire banking sector in same countries. "This publication provides a unique assessment of the entire co-operative banking sector in Europe. It confirms the special position and orientation of co-operative banks within the financial sector. Their member-based governance translates into pronounced differences in financial performance compared to other banks. Co-operative banks contribute to a kaleidoscopic banking sector which it is less prone to all kinds of shocks." H. GROENEVELD, Author, Professor at TIAS University of Tilburg. • The long term trend of an expanding member base continued in 2015: co-operative banks welcomed 1.6 million new members. • Divergent balance sheet developments between co-operative banks and entire banking systems persisted in 2015. Total assets of co-operative banks remained stable, while those of all other banks shrunk by almost 2 per cent. Since 2011, total assets and retail loans of all other banks contracted, whereas they grew at co-operative banks. This points to co-operative banks’ commitment to finance the real economy. • According to the analysis of the average return on equity (ROE) for the period 2002-2015 the ROE of co-operative banks exhibits a more stable pattern over a longer time period. Moreover the levels of ROE of co-operative banks outperformed the rest of the banking sector since 2008, showing that different banking models are causing different reactions to economic upswings and recessions. This underscores the need for diversity in banking for the sake of stability.The analysis also looks at other indicators including market shares, cost/income ratio and Tier 1 Capital. The TIAS Report concludes that co-operative banks engage in fewer and more stable business which secures stability in their performance. Their contribution is key to diversity in banking. The impact of (new) banking rules varies across banks with different ownership structures. However, the analysis shows that in recent years there is a tendency of convergence in many financial indicators. This may be due to the regulatory framework. Regulatory measures should not enforce convergence of business models and /nor the introduction of aspects of listed banks into well-capitalised co-operative banks with viable business models.